Granite countertops offer timeless beauty, natural durability, and unique elegance unsurpassed by your other countertop options. Available in a wide variety of colors and patterns, granite counters are the premiere choice for kitchen and bath projects. We understand the significant investment you're making when you choose granite, and we're here to help you make the selection that's right for you. Stop by our showroom to meet with one of our granite experts and discover the benefits of granite. As a locally owned business, customer satisfaction is our top priority! Longevity. Installing granite countertops ensures your kitchen or bath construction or remodel will last for decades. Granite's natural strength withstands heavy use for a lifetime. Strength. 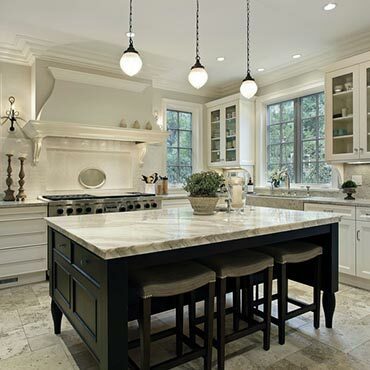 Granite countertops are the strongest counter surface available. With diamond-like hardness, granite is heat, stain, and stain resistant. Cleanliness. Not only is granite easy to keep clean, its natural properties combined with the applied sealants make saturation by germs impossible. Beauty and variety. Granite offers a virtually unlimited variety of patterns and colors and will add elegance and flair to any kitchen or bathroom design. Value. With granite counters continuing to increase in popularity, the price of granite has decreased. Installing granite countertops is also known to increase the value of your home.